One of the top recommendations that people get when they go through the PEERtrainer Fresh Start Cleanse is a total elimination of added sugar. This is especially true as the cleanse runs its course, and you can start to reintroduce some of the things you took out. But sugar is something that you are advised to continue to treat as public enemy #1. 1. Isn't There Such Thing As Healthy Sugar Like Honey And Agave? One common response to being told to eliminate sugar is to say, "Ok, I'll watch my sugar intake by switching to healthy sugars like honey and agave." We asked JJ Virgin this question, and she answered in ALL CAPS. I could literally feel the emotion jumping from the page. From her perspective, people who are dealing with weight loss resistance, or literally any other health issue, need to stay the heck away from sugar as much as possible. She lumps the term "healthy sugar" with oxymorons like "jumbo shrimp" and "military intelligence". Excess sugar consumption has been linked to a whole host of diseases. But one of the most interesting effects has to do with nutrient absorption. When it comes to your digestive system, excess sugar, even moderate amounts interferes with its ability to absorb nutrients. It is a whole lot more complicated than this. But once you understand that all forms of excess sugar "mess with your system" you will be much more likely to ditch the honey, agave, even fruit for a period of time. There are very few people who can't benefit from proper absorption of vitamins, minerals and nutrient. However, until recently, there have not been many studies showing how high sugar intake effect effects nutrient absorption. One recent study helped establish that high sugar intake "impaired" the digestive process. 3. How Much Sugar Is Too Much? According to the American Heart Association, they recommend no more than 100 calories of added sugar a day for a woman, a little more for a man. To give you a sense, 100 calories is equivalent to a large apple. Now I can hear your next question: But you can't possibly talking about the natural fructose in sugar. Apples, pears, blueberries all get a free pass, right? No. Wrong. Fructose, glucose, sucrose, sugar, honey, agave, it's all sugar. Yes, fruit has some extremely beneficial micronutrients, and of course you don't treat Coke and an Apple the same. However, historically fruit was not meant to be consumed in daily unlimited quantities. For weight loss and disease reversal, limit your fruit to one serving a day, while dramatically increasing the greens and non-starchy veggies. Another key concept: A very small minority of people actually stick to the recommendation of only 100 calories of added sugar a day. Almost all processed foods contain hidden sugars. Sugar is everywhere, and it is tough to avoid. Do yourself a favor: Look at all of the labels and sugar count of just your breakfast items alone to see how much your eating. If you're eating more than 25 grams of sugar at breakfast time, you're at your quota for the ENTIRE day. Which Fruits Should I Be Focusing On? "Certainly excessive sugar, especially fructose is a risk factor. However, if you eat properly and your diet is predominately vegetables and your body fat is low you will burn off the fructose/glucose for energy from the fruit you eat. Nevertheless H = N/C means less calories, high nutrient consumption. No fruit means higher risk of squamous cell carcinomas and GOMBBS, includes berries and pomegranates as super food linked to dramatic enhanced longevity. " For those of you following the PEERtrainer Cheat System, please note that most berries are in the unlimited column. And note that the consumption of greens is incentivized, which will help you increase the "N" part of Dr. Fuhrman's equation, which has been strongly linked to disease reversal and weight loss. There are different studies out there that show how different nutrients are effected by sugar. One interesting thing to note about JJ's advice are the consistent results we are seeing from people following her cleanse protocol, in conjunction with the concept of nutrient density that we have promoted for years at PEERtrainer. It would seem that when people eliminate toxins, it helps us better absorb all the nutrient dense foods we are now eating. 5. Does A Nutrient Dense Diet Give You A License To Eat Junk? What is interesting is that we are seeing people who eat nutrient dense diets, but with high levels of sugar--who are having some health issues like high cholesterol and triglycerides. Not only do some people think that certain sugars are "healthy"-- many people think that as long as they eat plenty of greens, it gives them a free pass in other areas of their diet. Your numbers will speak for themselves. "Excess sugar is known to contribute to obesity, diabetes, and other conditions linked to heart disease, and now new research links it to unhealthy cholesterol and triglyceride levels." This is the tip of the iceberg when it comes to sugar consumption. There is a ton of older research as well showing the harmful effects of sugar, but we wanted to show you some of the recent research. If you have any questions about how sugar is effecting your health, visit your doctor and get your numbers checked. Should I Remove Gluten From My Diet? [Editorial Note: For maximum weight loss results and overall better health, cleanses are often used. This aids the body with detoxification and balance, but also helps with weight loss reduction. But there are some things to be aware of before you cleanse. Nutrition, health and weight reduction expert, JJ Virgin PhD, has spent the last 15 years educating doctors and patients on how to cleanse properly. Like What You've Read? ... Republish It And Share The Good Health! We believe great content should be read and passed around. After all, knowledge IS power. If you'd like to share any of the informative articles on PEERtrainer.com, you may republish or syndicate without charge. 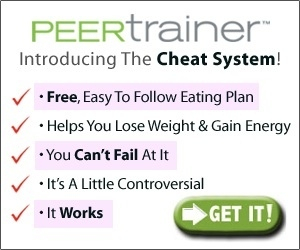 "This information is provided by PEERtrainer.com, the web's leading weight loss community and resource for long term, healthy weight loss success. To sign up for free daily weight loss and motivation tips and more visit http://www.peertrainer.com." We will NEVER rent or sell your email to any third-party. First off, I would like to congratulate everyone who took the time to visit this blog. You’re off to a great start on receiving information that’s gonna help you on your weight loss journey and even better health. This blog isn’t only for weight loss, but more importantly, better health. Just do your homework on the info you’re given in order to get the piece to your missing puzzle. Your body will truly thank you later. I once read from Peer Trainer ( great site that gives floods of info on all the aspects of weight loss ) on how to “program” your hormones to burn fat. I never though it be so easy, or simple at least. What’s simple is not always easy, but doable and definitely worth it. First of all, let’s define hormones. They are chemical messengers that tells your body to burn fat, store fat, burn muscle or build muscle, and even give you energy. For those of you who don’t know, foods like eggs, gluten, dairy, peanuts, soy, artificial sweetners, and sugar are all reactive foods- meaning you can have a reaction ( or reactions ) from consuming these types of foods. Just as importantly, it is imperative that you get to the root cause of your weight gain. Have an open mind that something’s not right and something’s missing, and deal with it head on. That’s key to getting on the right track. You have to change your whole mindset or way of thinking so that you won’t end up gaining back your weight, or even worse, not loosing any weight at all. Please be honest with yourself. Do you know that stress causes the body to “hold on” to weight? Bad stress releases a type of hormone called cortisol that puts on weight, especially in the mid section. Even if it may be a bit challenging at first, find a way to get some kind of “me” time that will help you relax. Take one day at a time. If you fall, get back up and get right back on track. Keep your focus and surround yourself with people who will get behind you and support you. Keep the main thing the main thing. Here are just some of the things that will help you get going on your weight loss journey that has helped and is helping me. I’m not conveying to your what I heard or just read, but this is stuff that I’ve done, or in the process of doing. This is all tried and tested stuff I’m giving you here. 1. Eliminate snacking and cravings. This is so key. This was a biggie for me. I love to snack. This one was really hard for me to let go. I could go without eating a well-balanced meal and just snack all day. I would eat because I was bored. It gave me a “high”. I had a lack of discipline that eventually spilled over into my eating habits. Again, getting to the root issue is what’s going to help you in dividends. You may ask, “how do I do that, and I will tell you first off to start and finish a thorough detox cleanse. Colon cleansers are good, parasite cleansing is good, and liver detox is also good. The liver is the largest eliminating organ, and it works hard everyday, so don’t forget about that liver . The only 2 things that I hadn't gotten around to yet on this blog is Cat's Claw and Pure Berry Acai Cleanse & Colothin Advanced Cleanse from Rachael Ray's blog. The Cat's Claw is suppose to help clean the Colon, help boost the Immune System, help to tone the body, anti-cancer properties, good for Bone health, and even a natural pain killer. Follow that up with a good probiotic will help ensure success when you add it with your detox program because it puts the good bacteria in that also comes out when you do a cleanse. www.renuherbs.com have a good line of products. I like the “detox trio” myself. There are hundreds and hundreds of products out there, so make sure you do your homework first before investing in cleansing products. Also getting your adrenal glands functioning properly helps. What helps me is liquid vitamin B12, which helps with energy. I take it twice a day so that fatigue won’t set in. I also like credible sites such as: www.jjvirgin.com, www.valeriesaxion.com ( her site has all the info you need about Cat's Claw), womentowomen.com/adrenalhealth and mercola.com. These are the few websites that has helped me out in not just loosing weight, but being in better health and having a good sense of well being. I also heard a lot of buzz about Rachael Ray's Acai Cleanse program as well, and hear nothing but good things about them. Just do your homework and see what’s best for you. 2. Get a good night's sleep. When you don't get adequate sleep, you eat more. A chemical reaction is released in your body to increase hunger. Yes, people who don't sleep good are more than likely to overeat. With benefits like these, who wouldn’t want to add this to their diet!? Plus it’s inexpensive. Green veggies have detoxing properties. Did you know onions have anti-fungal properties too? 4. Eat according to your blood type and nutritional type (which is different for everyone) mercola.com has articles about this. 5. Don’t forget the water. Whatever your weight is, simply divide it by 2. That’s how many ounces of water we’re suppose to drink a day. A lot of times you think you're hungry when you're thirsty instead. When you're properly hydrated, you tend to eat less. 6. Sweating is another component of detoxing the body. That’s why exercise is so important as well. Keep in mind that the skin is also an eliminating organ. After a good workout, I like to go sit inside a sauna for about 30 minutes to even an hour. Talk about relaxation. Look into different types of exercise such as bursting, walking, “T Tapp”, and dancing. You can google all of these exercises to see the benefits, and I love doing every one of them (especially bursting because it releases the growth hormone (HCG ) which expedites weight loss, but that’s up to you to decide which works best for you) . What will truly benefit you the most is actually doing something that you love and look forward to doing. That actually releases “feel good” endorphins and increases weight loss. That goes back to getting those hormones in control. By no means am I down-playing exercise when I say this, I know how important exercise is; the key is to move. Stay active. The thing to weight loss is knowing this: Exercise is only 30% towards weight loss, but your diet is 70% towards weight loss. That’s why 1st changing your mind, then making a lifestyle change of eating better & putting the right stuff in your body & cutting the stress is key in your journey to weight loss and better health lies. If you don’t change your mind or mindset, you won’t have lasting change or any change at all. 7. Keep away from foods that have a high glycemic load (foods high in starch ). Stick with foods high in fiber and low glycemic carbs such as lentils, apples, berries; fruits & veggies that’s high in fiber, which helps stave away hunger and slows stomach emptying. Right now I’m on a regimine that consists of high protein & fiber. The plan I’m on is only temporary. There are some foods out of my diet, but once I’m where I want to be, I’ll be taught on how to incorporate those foods back in my diet so that I won’t gain the weight back. Quick Weight Loss Center helps you do just that. Eating healthy oils such as olive oil, coconut oil, hempseed & flaxseed oils. (good for putting into smoothies as well ) These types of oils releases a neurotransmitter that tells your brain “you’re full”. 8. Eating at the right time. I know this may go against a lot of people’s grain and what we’ve been taught or told, but we’re suppose to eat every 4 to 6 hours instead of every 2 to 3 hours. Let me explain why. Number 1, eating every 4-6 hrs helps boost the metabolism. Number 2, when you eat every 2-3 hrs, the body burns sugar, not fat. You don’t want to burn muscle, you want to burn fat. You want to make everything count, not defeat the purpose. It was a bit challenging to me at first too, that was something I just didn’t want to do, but you have to train your stomach on how to eat right too. When you eat every 4-6 hours, you burn more fat and get the most benefit. Just start out eating every 4 hours until you can go longer. A lot of us eat out of boredom, habit, and recreation, but you can train your body to eat when you’re suppose to, and not just when you want to. Every small change and step you make will have a big impact on your health and journey to a smaller you. All I ask is that you don’t sit on the info that’s been given to you. ACT on it. Remember, doing the same ole thing and expecting change or results = insanity, and change = ACTION, and ACTION = RESULTS. Consistency is the key to change. Stay with it. I truly hope you all have gotten something good out of this. Being on a journey to weight loss and most importantly better health is a lifelong journey and process. Here’s to LONG LIFE/ STRONG LIFE. Please share your thoughts. I’d like to hear from you. I would love to hear other people’s input on how they lost weight and changed their lifestyle. Share your story.